Scooby-Doo! And the Legend of the Vampire Scooby and the gang are attending a concert at Vampire Rock, Australia when the Yowie Yahoo vampire starts kidnapping the musicians. Scooby-Doo! and the Monster of Mexico (2003) A friend of Fred's, Alejo Otero invites the Scooby gang to Veracruz Mexico where they find the monster, El Chupacabra is terrorizing the town. The Lord of the Rings: The Return of the King (2003) Aragorn is revealed as the heir to the ancient kings as he, Gandalf and the other members of the broken fellowship struggle to save Gondor from Sauron's forces. Meanwhile, Frodo and Sam bring the ring closer to the heart of Mordor, the dark lord's realm. Detective Conan Movie 07: Crossroad in the Ancient Capital Mouri Kogoro is called to a special case in the ancient capital of Kyoto. 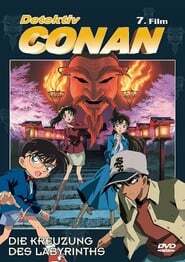 There, Conan meets Heiji and they team up once again to solve the case, recover the stolen Healing Buddha statue, and even discover the identity of Heiji's first love. A Mighty Wind (2003) In "A Mighty Wind", director Christopher Guest reunites the team from "Best In Show" and "Waiting for Guffman" to tell tell the story of 60's-era folk musicians, who inspired by the death of their former manager, get back on the stage for one concert in New York City's Town Hall. The Jungle Book 2 (2003) Mowgli, missing the jungle and his old friends, runs away from the man village unaware of the danger he's in by going back to the wild. Intolerable Cruelty (2003) A revenge-seeking gold digger marries a womanizing Beverly Hills lawyer with the intention of making a killing in the divorce. Belly of the Beast (2003) Jake and Sunti go to meet Mongkol, the leader of the Abu Karaf. Mongkol confirms that ever since the terrorist attacks of September 11, 2001, Jantapan has worked to corner the narcotics and arms markets. Jake must engage in a battle that will put both his physical and spiritual powers to the ultimate test. Garden of Love (2003) veral years after a musician and his friends are killed, his daughter is haunted by her dad, whos spirit is on killing spree. Dumb and Dumberer: When Harry Met Lloyd (2003) This wacky prequel to the 1994 blockbuster goes back to the lame-brained Harry and Lloyd's days as classmates at a Rhode Island high school, where the unprincipled principal puts the pair in remedial courses as part of a scheme to fleece the school.